Accordingly, it is important to properly manage waste within and effectively plan physical systems (i.e., infrastructure, technology etc.) of cities, if the cities are to function adequately as a safeguard protecting residents from possible future dangers and threats which are inevitable. However, much of the population in the Asia-Pacific region still lacks appropriate waste management strategies and city planning policies, and this is due to a fact that developing strategies and policies requires a multilateral effort which encompasses technical, institutional, financial, social and cultural challenges. Other hindrances include the low priority given to waste and resilient city related issues and lack of awareness and knowledge among citizens. This workshop represents an unparalleled opportunity for government officials and other key actors in the Asia-Pacific region to strengthen their capacities and knowledge in the practice of waste management and resilient city planning. Participants will not only improve their career opportunities, but also will expand the reach of their global network. In addition, the 6th UCLG ASPAC congress will be convened in parallel to benefit both the participants and the general public who want to understand about strategies for sustainable regional development, global issues and ways of cooperation. 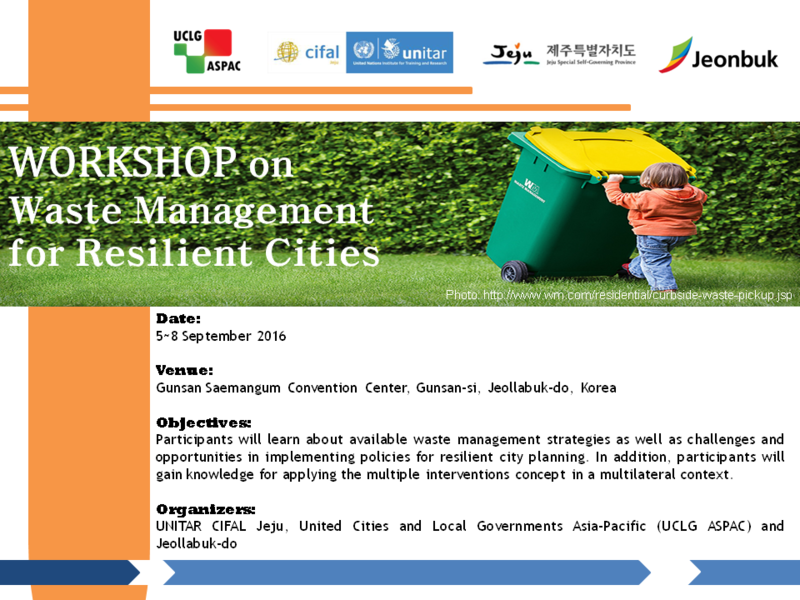 Participants will learn about available waste management strategies as well as challenges and opportunities in implementing policies for resilient city planning. In addition, participants will gain knowledge for applying the multiple interventions concept in a multilateral context. •	propose reforms in the global waste management and city planning. •	submit necessary documents on time, i.e. , registration form etc. •	complete and submit pre-training readings and assignments, i.e. self-assessment, case study presentation, e-learning modules etc. •	Application without required documents will NOT be considered. •	Participation is subject to approval of the application by UNITAR CIFAL Jeju. •	Selected applicants will be notified individually. • UNITAR CIFAL Jeju provides LIMITED financial assistance with the airfare to Gunsan-si, Jeollabuk-do, Korea (see the agenda). • Local expenses (transportation, accommodation and meals) during the workshop will be covered by UNITAR CIFAL Jeju. Silva, J. D. (Ed.). (2012). Visions of a resilient city. Resilient Cities 2012 Competition Synthesis Paper.